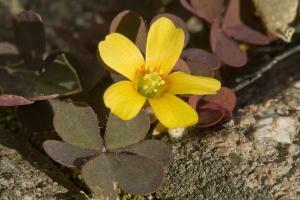 Wood sorrel (Oxalis spp. 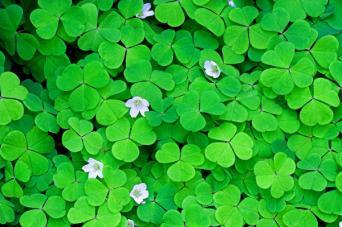 ), also known as false shamrock, is a large group of woodland plants with lush foliage and delicate flowers. A number of species are used for ornamental purposes as both groundcovers and container gardens. Wood sorrels are often marketed as 'shamrock' plants around St. Patrick's Day. True shamrocks are actually a type of clover though wood sorrels bear a close enough resemblance to pass for a substitute. Most wood sorrels grow less than 16 inches tall and spread via underground runners to form extensive carpets. Their heart-shaped leaves can range in color from bright green to purplish and red tones, depending on the variety. Flowers are usually white, yellow or pink, though other colors can be found. Wood sorrels are shade-loving plants, often found growing alongside mosses in the filtered light of forest trees, though they can tolerate morning sun in the garden. They need rich, moist soil and good drainage to thrive. Cool climates are the most hospitable to wood sorrels; in hot summers, the foliage often goes dormant. 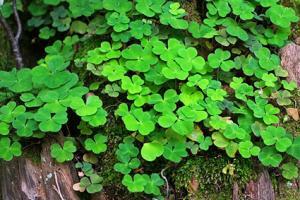 Ferns, hostas, heucheras and other forest plants are ideal partners for wood sorrel. They are great fillers in the shade garden, fluffing up the space around other larger plants with their lush foliage. Wood sorrels are also useful in planters as a low-growing accompaniment to upright specimens like Japanese maples or hydrangeas. They are not a true trailing plant though they will spill over the edge of containers a bit. In general, wood sorrels make great edging, whether softening the hard edges of a pot, a retaining wall, or a concrete pathway. Fall or early spring is the ideal planting season. Plant wood sorrel in rich woodland soil or plan on incorporating several inches of compost into the planting area before putting wood sorrel in the ground. Ordinary potting mix is perfect for growing wood sorrel in containers. Keep wood sorrel evenly moist throughout the growing season. Maintain a layer of leaves as mulch around the plants to help conserve moisture, keep the roots cool and add organic matter to the soil. Remove the dead sorrel leaves after they turn yellow in fall. Slugs and snails are a common problem with wood sorrel. Use a commercial product like Sluggo to deter them and remove hiding places like overturned pots that may be near the plants. Fungal diseases like powdery mildew can occur on the leaves, especially where air circulation is poor. Prune back surrounding shrubs to help improve the situation and use fungicides to treat if necessary. Spider mites and aphids also commonly attack wood sorrel, but are easily treated with insecticidal soap or simply sprayed off with a blast of water from the hose. Wood sorrel has a variety of historical medicinal uses, such treating digestive disorders and vitamin C deficiency, although caution should be taken regarding its use for children and adults with certain health issues. Perhaps its most common use today, however, is as a healthy snack - the leaves are entirely edible and have a unique tangy flavor. Cut the leaves with garden shears or just pull them off. Wood sorrels are not the most common nursery plants, so here are a few places to purchases the most popular varieties. Pink wood sorrel (Oxalis crassipes or 'Rosea') is available at Plant Delights Nursery, Inc. for $13. This variety grows to 10 inches tall and has hot pink flowers and green foliage. It's suitable for USDA zones 5 to 9. Purple shamrock (Oxalis regnellii or 'Francis') is available at Logee's for $13. This variety grows to about 16 inches and has deep purple foliage with white blossoms. Grow it in USDA zones 7 to 10. Iron cross shamrock (Oxalis tetraphylla or 'Iron Cross') is available at Bonanza for $8. It grows six to eight inches tall and has bright green leaves with dark reddish-brown splotches in the center and pinkish-red flowers. It's hardy in USDA zones 6 to 10. People often buy wood sorrels for St. Patrick's Day without realizing that the plants can be put in the ground after the holiday is over. They tend to hang on for a while as houseplants, but will come back year after year if they are placed in an appropriate location outdoors.